When you need custom content for your business, you don’t want to trust the project to just anyone. That’s why we scoured the Internet for objective and qualitative data, then compiled a list of the top 10 content marketing services available today. Now we’re delving deep into each company on the list. Today we’re looking at the number-five content service: CopyPress. Based in Scottsdale, Arizona, and Tampa, Florida, CopyPress is the brainchild of Dave Snyder, an Internet personality and entrepreneur. It offers traditional content writing services as well as design for videos, infographics, and other forms of digital media. 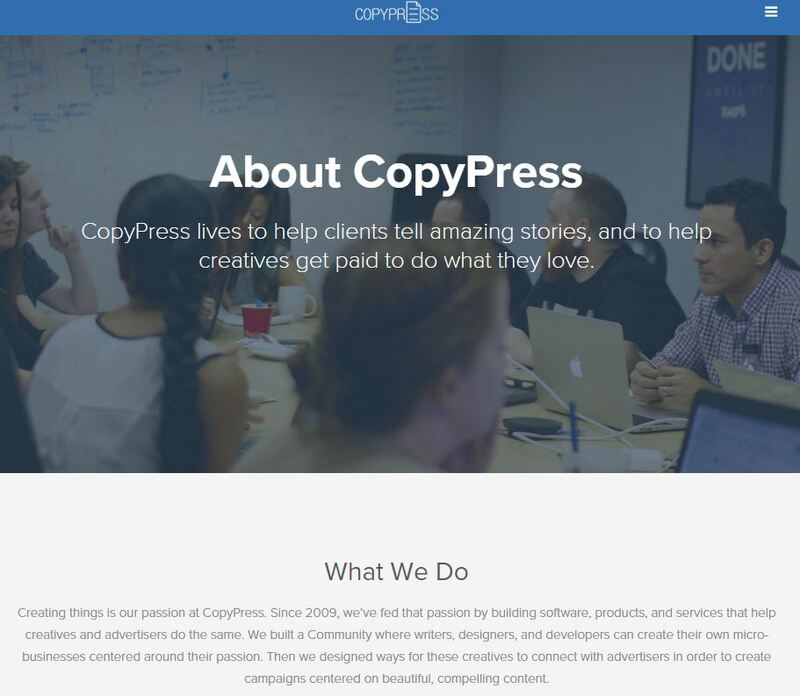 What’s the CopyPress Experience Like? Explore the different types of content CopyPress offers on its website. You can order several types of content from CopyPress, including expert articles, press releases, product copy, e-books, and white papers. You can order single pieces of content or large batches, depending on your specific needs, and the CopyPress staff will guide you through the process. Strategy: A content strategist reviews your needs and helps you develop a strategy that fits your goals. Ideation: Writers, editors, or campaign managers come up with topics and ideas for your content. Writing: CopyPress pairs its clients with writers who have the experience necessary to complete the assignments. Editing: Professional editors review each piece of content, make corrections, return them to the writer if necessary for corrections, and approve them. Quality Control: Campaign managers review the content and submit it to the client for approval. What Do CopyPress Clients Pay? CopyPress doesn’t advertise its rates for clients, but each project is evaluated based on the research level, length, and other specifics to create a custom rate. If you’re considering working with CopyPress, you can request a custom quote from the company and decide if it fits your budget. Do You Have a Choice of Writers at CopyPress? The quality control team at CopyPress handles all communication with writers. If you like a particular writer’s work, you can request to work with him or her again. In the Content Management System, you can leave feedback for writers on individual pieces of content or communicate your feedback to the campaign manager. Will CopyPress Promote Your Content? Most of the content created by CopyPress is given to the client for publishing, distribution, and promotion. There are special programs for partnering with industry publishers who can promote your business, but you’ll have to make that arrangement with the company. How Do You Publish Your Content? After you approve content through CopyPress, you’re responsible for publishing it to your blog, website, social media platform, or other web property. If you’re planning to use the work through a content distribution channel, you’ll have to set it up and monitor it. How Is Customer Service at CopyPress? If you have an issue with your content or customer experience, you can reach out to your campaign manager to discuss the issue. CopyPress staff members are available via phone and email whenever you have a question or concern. You can also interact with the company on Facebook, its blog, or other online platforms. 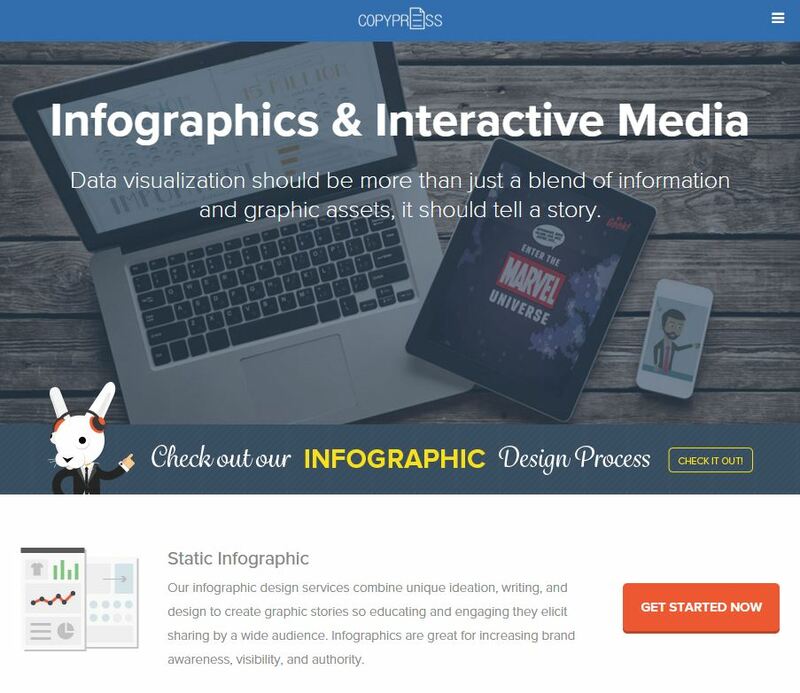 CopyPress will create infographics for you–a nice bonus. What Do Other Customers Say About CopyPress? The company has an A+ rating with the Better Business Bureau and enjoys a four-star rating on Facebook. If you’re concerned about customer experience, consider asking CopyPress for information about past clients. When Should You Use CopyPress? CopyPress offers a robust team of content professionals who can help you create compelling content. This is a good service to choose if you need help brainstorming ideas, creating a campaign direction, and developing well-written content. The lack of inherent promotion and distribution services might make CopyPress a less-than-ideal choice for businesses that want to build inbound links and accomplish similar goals. For instance, if you’re hoping to distribute your content far and wide, you’ll have to organize the campaign yourself. Stay tuned for more in this series as we continue to provide in-depth reviews of content writing services. The more you know about your options, the easier it becomes to make an educated choice.